On the way to Quito, on the first climb after Otavalo, we met three heavily laden cyclists, Ignacho, Romina and Javier from Argentina, heading north. 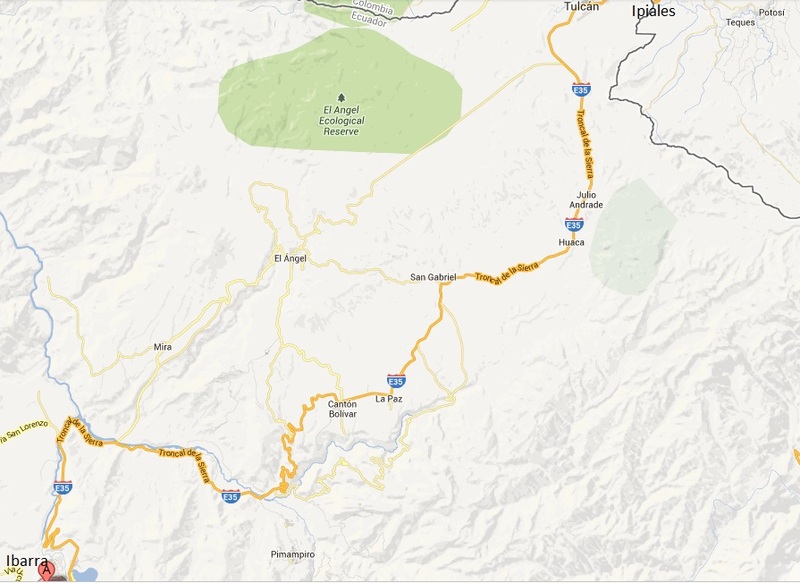 In an extended break we exchanged road experiences, directions and hints and they recommended us the casa de ciclistas in Tumbaco, a suburb of Quito. It turned out to be a very lucky suggestion: when we arrived late in the evening, we were picked up by Santiago and Ana Lucia at the central parque and warmly welcomed by the whole family, by Ana Carolina and Micaela, the grandmother and an aunt. 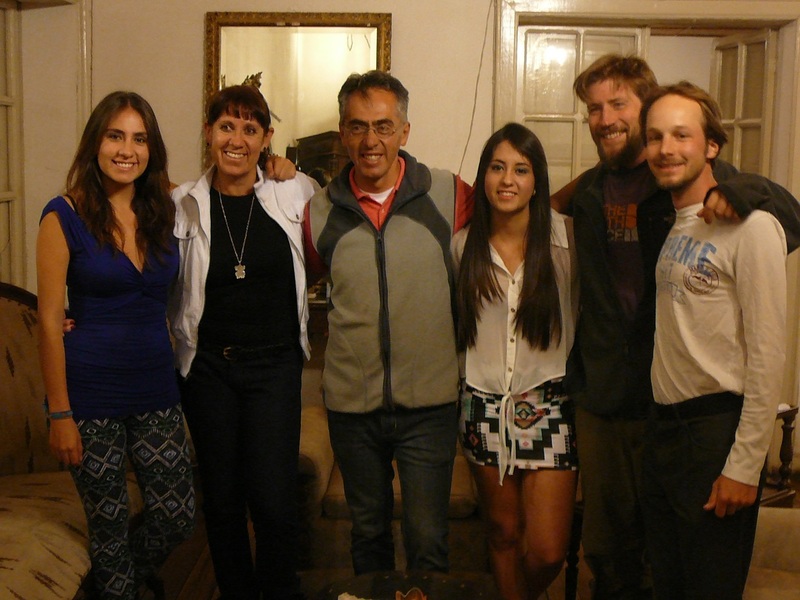 Santiago, a ambitious (mountain) cyclist himself, opened his house for world cyclists twenty years ago. 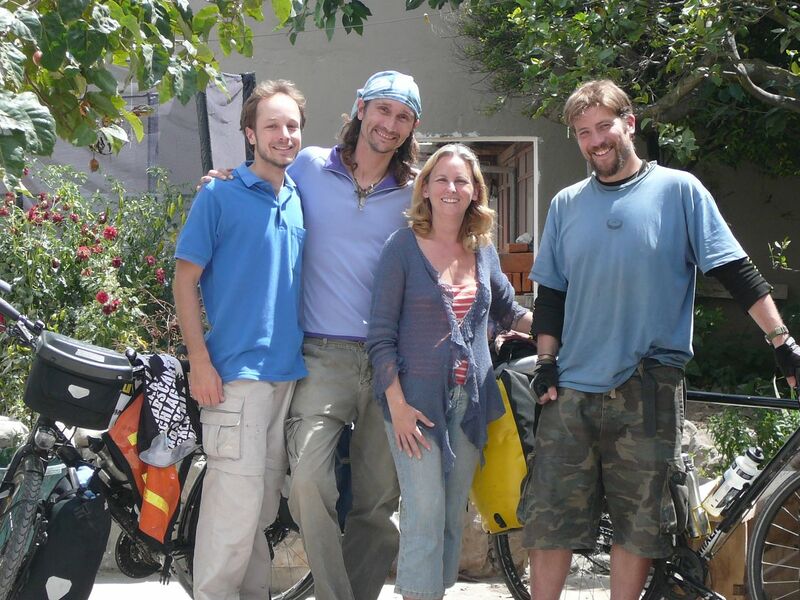 Camping in their garden, we enjoyed for one week their friendly hospitality: talking shop about the subtleties of bicycles (Santiago knows and repairs everything), talking about life and travelling and about the churches of Quito (ancient temples). It was a time of recreation, of cultural discoveries and of amity. And we met there Phil, an adventurous guy, cycling the world for already four years. El destino triste de viajero es que todas experiencias son pasajeras. Pero estos recuerdos amables nos acompañarán! Todo lo mejor a vosotros! Dieser Beitrag wurde unter Auf Englisch, Ecuador, Encuentros abgelegt am 7. Juli 2013 von skuttruf. In our two visits, Quito showed us its two faces: the old part in the south, densely peppered with churches from baroque and colonial era, with hilly streets of copple and generous parks and places. And the new part of the city, high-rise buildings of the 70’ies, american hostels in gringolandia and stretched out highways. Quito is beautifully placed on a mountain platform at 2800m with buildings on the ridge to the valley, it is the second highest capital of the world and the only highlands along the ecuator. The museum of ecuatorian culture impressed us with the highly advanced manufacturing techniques of gold and copper, and together with Carolina from Tabacundo, who spent a few days working in the city, we enjoyed the Capilla del Hombre of the national artist Guayasamín, a haunting memorial for the suffering of mankind. We were honored with the opportunity to visit the governmental palace but did not meet Correa this time. Nevertheless we had a nice discussion about Moreno, one of the most controversial presidents and womanizers in ecuatorian history. 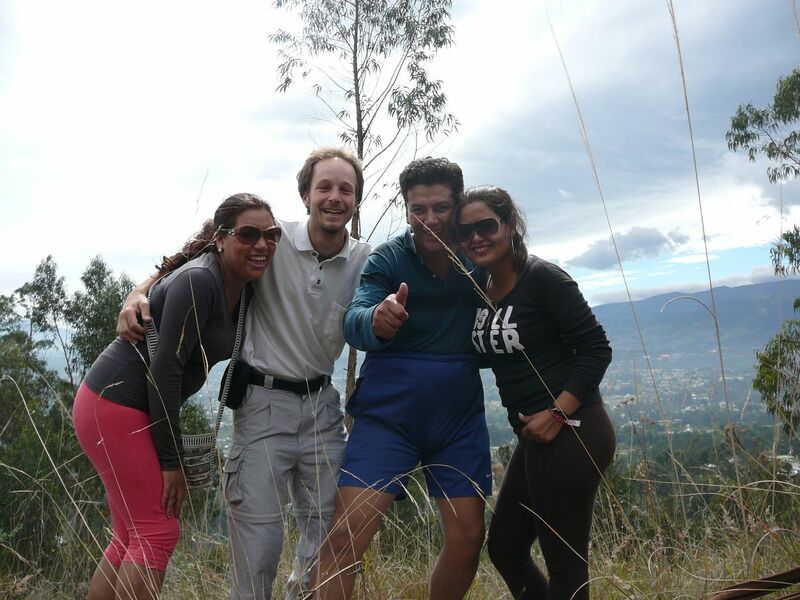 In the bus backwards, passing on a steep road the ancient suburb Guápulo, I met Lili, a merry and pretty girl, who invited me to a hike on a nearby mountain: together with her brother Thomas and his girlfriend Susana we passed a jaunty leisure time on the heights of Quito. Dieser Beitrag wurde unter Auf Englisch, Ecuador, Encuentros, Vivencias abgelegt am 4. Juli 2013 von skuttruf. Sometimes, it happens that you just feel in the right place at the right time. We’ve barely built up our tents in the frontyard of a ranch we’ve found along the road when the kind family invited us to the fiesta de San Pedro in Tabacundo. The whole village was on its feet: the man in the clothing of Aruchicos, the women in beautifully woven skirts, and even the children dressed up in traditional midget costumes. The men playing instruments and singing, the women dancing, and, at times, in front of a group passing by, el diablo, cracking the whip. It was only a limited range of songs and melodies, but, in the endless loop, the music captured the bodies and made them the figural and will-less expression of its rhythms. Hovering skirts, swaying hips and stamping feet. You don’t feel lonely in the crowd, what is personality, what is our specific individuality, but you feel closer to the stream of life, just watching, just listening, just moving. The fiesta lasted for the whole night and the other day. In the afternoon, together with Carolina, we had the chance to take a ride on some horses of the ranch, for me the first time after about 20 years: it’s not just another means of transport! A horse has his own will and the covered distance is a compromise of your demands and its courtesy. German, the owner of the Ranch G, a man full of energy and life, last man standing after a long night with Chicha, his own caña liquor, lighted a hellfire to warm us up by the fireside and the night passed rapidly with stories of his hitch-hiker time in Europe. After a hangover breakfast we bid a cordial farewell from this amicable family and hit the road again heading through desert land to Quito. Dieser Beitrag wurde unter Auf Englisch, Ecuador, Encuentros, Vivencias abgelegt am 30. Juni 2013 von skuttruf. Otavalo is mainly known for its Poncho market and the business acumen of its habitants. Since a cycling traveller might take along only memories, we rather planned to ascent the near vulcano Cotacachi (4935m) spending one night in the tents. Looking desperately for hiking boots in the whole village, I could find only shoes up to size 40. I finally squeezed my size 42-feet into one pair. In this moment (and in the many painful moments to come), I somewhat questioned my concept of lightweight travelling: to buy stuff only on the fly, when needed. Arriving with full-fledged camping equipment at the beautiful Laguna de Cuicocha, a deep blue lake in the former crater, the guardian of the national park prevented us from going further: camping is permitted only with a local guide. After some disappointment, we left the major part of the luggage with him (as I later noticed, we still carried Andi´s heavy stove!) and went for a nice 5 hour tour around the lake. When we returned at dark, a heavily armed guy guarded our luggage, but, alas!, in deep sleep. To not wake him up, we smuggled silently our luggage out of the open door. Staying the night in a hut at the lagoon, we met David, since 10 years development worker in the region, who told us about the ongoing and dreadful struggle between the Andenean tribes and the big oil companies. Early the next morning at 4 a.m. we passed again the guardian’s gate to walk up a long and stony road in the mist for a couple of hours. The bright half-moon accompanied us. Here the moon is not standing vertically but lying horizontally like a cradle. We reached the trailhead at 4100m shortly after sunrise. While the view reached even to Quito on the far horizon, the summit was covered by low hanging clouds and proceeding was pointless. Coming back after 8 hours of walk with blisters on my feet, we spent the afternoon watching the lake. Dieser Beitrag wurde unter Auf Englisch, Ecuador, Encuentros, Vivencias abgelegt am 27. Juni 2013 von skuttruf. Passing the frontier was not a great deal: no controls at all, we only needed the stamps for the 90 days permit. 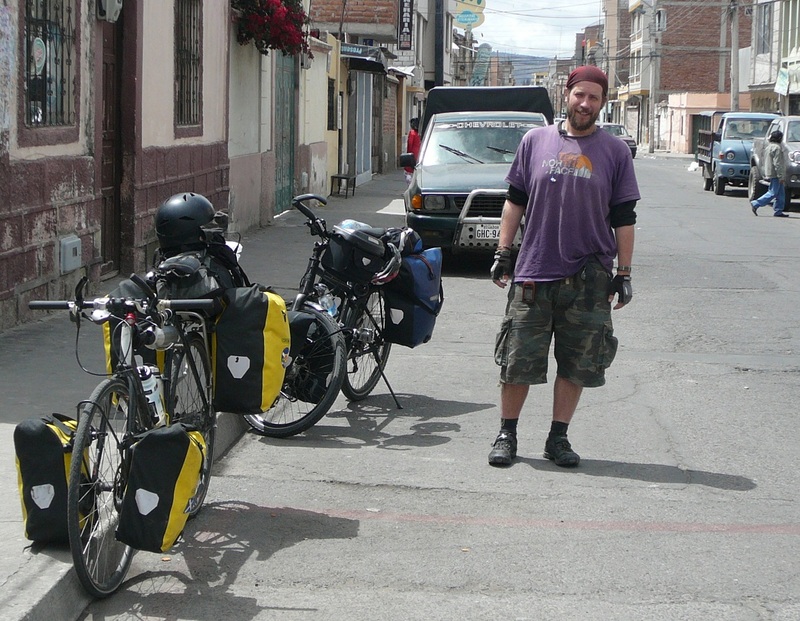 Then we were in Ecuador. After lunch in the rather unspectacular transit village Tulcán, the climbing to the next pass of about 3300m at 13ºC costed some overcoming. But we enjoyed the intense green of the surrounding hills and then a long descent to more comfortable temperatures. We spent a night in the small mountain village San Gabriel where I ate for the first time Bolónes de Verde, a delicious purée of bananas filled with cheese. The next day started with a long descent into the valley of Río Chota, during which I broke my own speed record with 68,03kph. Its dry and hot rock desert is populated exclusively by black people whose ancestors were brought here as slaves by Jesuits and merchants in the 17th century. When crossing a small village with a lot of folk dancing on the street in front of big loudspeakers, something grazed my head: two young girls pelted us with roses from a roof. We shot back with bracelets and they posed for a nice picture. Climbing up once more in a stretched out u-turn we reached Ibarra at dark. For the first time, I was attacked: by a young guy running after our bicycles and jumping at my luggage, while insulting us for nothing. Shortly after this incident, standing pondering in the street, we were invited by two Belgians to pass the night at their hostel. 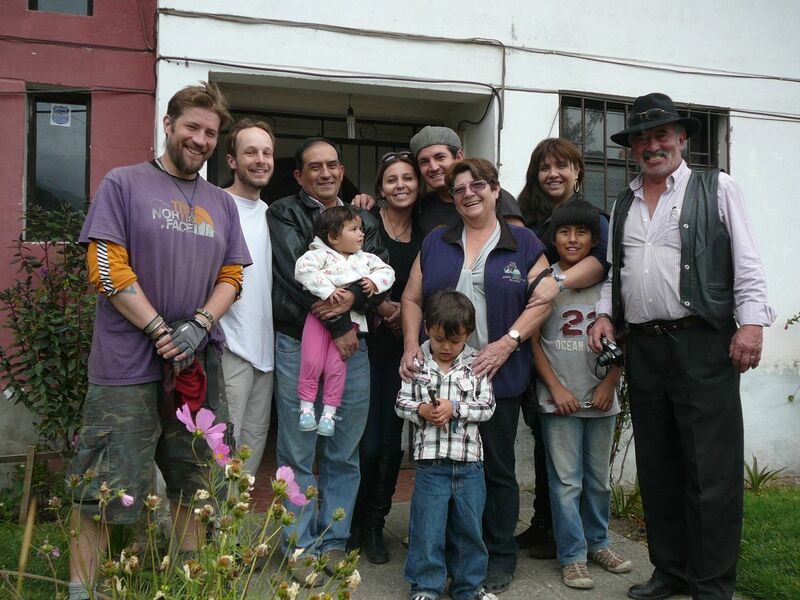 That’s how we met Chantal and Toni who moved with their kids a year before to Ecuador to set up their own business with a European style hostel. We shared with them a wonderful time, discovering the marketplace and the colonial architecture of the town, discussing about their conception of life and the European anxiety and about our plans. We just drafted a little website for them and wish them all the best for their project! Muchas gracias por todo! Dieser Beitrag wurde unter Auf Englisch, Ecuador, Encuentros, Vivencias abgelegt am 24. Juni 2013 von skuttruf.